Okay, so this weeks's tip is something super simple and it might be somewhat obsolete for some really fashion forward people, but I still love it none the less! You know how tying your belts in knots has been all the rage this year? It's cute but I'm not the biggest fan of it (sorry,I'm just not that cool)! So what I like to do when I wear my belt around my waist (and have excess length) is add an elastic band at the end of the belt that matches the belt. I either hide the thin elastic on the side or under a belt loop (if I'm wearing it at the hips).That way you won't have your belt flailing forward. It also gives your look more of a timeless sophistication (or at least I like to think so)! 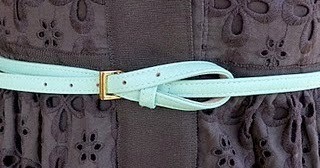 I have the elastics in just about every color, so that regardless of which belt I choose, the elastic wont stand out. You can see the elastic in the picture below. Awesome idea! Seriously. I've had to use electrical tape to get my belts to stay before. Haha. This is easier and way more attractive! Thanks Ellie! I'm so glad it was useful to you! I've kind of felt like I'm the only one not on board with the super trendy knot tying style these days. I'm happy to know I'm not the only one;)!